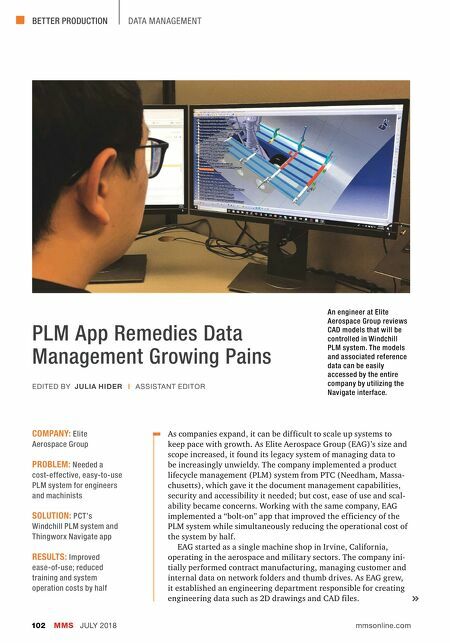 BETTER PRODUCTION MMS JULY 2018 102 mmsonline.com DATA MANAGEMENT PLM App Remedies Data Management Growing Pains As companies expand, it can be difficult to scale up systems to keep pace with growth. As Elite Aerospace Group (EAG)'s size and scope increased, it found its legacy system of managing data to be increasingly unwieldy. 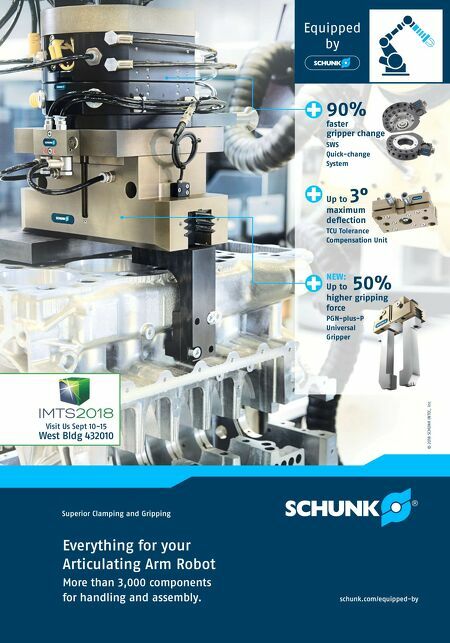 The company implemented a product lifecycle management (PLM) system from PTC (Needham, Massa- chusetts), which gave it the document management capabilities, security and accessibility it needed; but cost, ease of use and scal- ability became concerns. Working with the same company, EAG implemented a "bolt-on" app that improved the efficiency of the PLM system while simultaneously reducing the operational cost of the system by half. EAG started as a single machine shop in Irvine, California, operating in the aerospace and military sectors. The company ini- tially performed contract manufacturing, managing customer and internal data on network folders and thumb drives. As EAG grew, it established an engineering department responsible for creating engineering data such as 2D drawings and CAD files. COMPANY: Elite Aerospace Group PROBLEM: Needed a cost-effective, easy-to-use PLM system for engineers and machinists SOLUTION: PCT's Windchill PLM system and Thingworx Navigate app RESULTS: Improved ease-of-use; reduced training and system operation costs by half EDITED BY JULIA HIDER | ASSISTANT EDITOR An engineer at Elite Aerospace Group reviews CAD models that will be controlled in Windchill PLM system. The models and associated reference data can be easily accessed by the entire company by utilizing the Navigate interface.